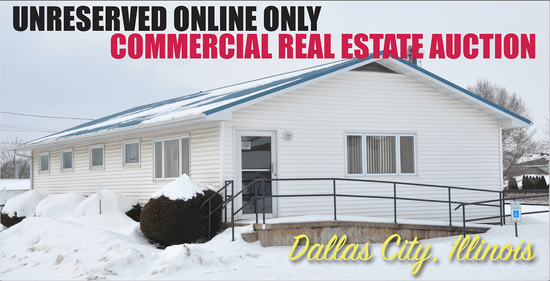 Unreserved online only commercial real estate auction of property located in Dallas City, Illinois. This will be a timed online auction with a "soft close". Payment Instructions: Immediately following the close of the auction, the successful bidder will be required to enter into a purchase agreement. Purchase Agreement will be emailed to address on file and contract must be returned via email or fax. Immediately following the close of the auction, the successful bidder will be required to pay a non-refundable deposit equal to 10% of the total purchase price. The balance of the purchase price is due at closing. Failure to execute and return contract with deposit will be considered in default. Bidding on the property is not contingent on financing, appraisal or any other contingencies. Preview Date & Times: Open House: Saturday, February 9th from 10:00 - 11:00 A.M.
Property is offered under the specific terms provided in the printed and electronic versions of the auction brochure. Any and all inspections are the responsibility of the buyer prior to auction. Buyer is responsible for reviewing auction listing prior to close of sale to inspect any changes, corrections, or additions to property information. Property is being sold as is. Online bidders must register 72 hours in advance of the auction by emailing the following information to sold@sullivanauctioneers.com: * Full legal name * Home mailing address * Email address * Daytime/evening phone number * Current letter of credit addressed emailed to Sullivan Auctioneers LLC Sullivan Auctioneers, LLC reserves the right to deny registration. Immediately following the close of the auction, the successful bidder will be required to enter into a purchase agreement. Purchase Agreement will be emailed to address on file and contract must be returned via email or fax. Immediately following the close of the auction, the successful bidder will be required to pay a non-refundable deposit equal to 10% of the total purchase price. The balance of the purchase price is due at closing. Failure to execute and return contract with deposit will be considered in default. Bidding on the property is not contingent on financing, appraisal or any other contingencies. This is a no reserve, absolute auction. Sullivan Auctioneers, LLC are licensed auctioneers representing the seller(s) in this transaction. Unreserved online only commercial real estate auction. This will be a timed online auction with a "soft close". The building is a single story with 1,400 sq. ft. (28' x 50'). Other features include a high efficiency gas furnace with central AC, full basement, front & back wheel chair accessible exterior doors, several partitioned offices along with bathroom and reception area. The building had a new metal roof installed in 2017. Open House: Saturday, February 9th from 10:00 - 11:00 A.M.